GABAergic inhibitory interneurons (INs) account for approximately 10-20% of neurons in the rodent cortex. Of these, about 20-30% express a peptide called somatostatin (SOM). Most study into the function of SOM INs has focused on one class in particular called the Martinotti cells. Martinotti cells have axons that ascend to the most superficial layer of the cortex, contacting distal sites on the dendrites of excitatory pyramidal cells. Recent papers, like this one from Massimo Scanziani’s group, highlight the role of layer 2/3 SOM INs in mediating surround suppression of layer 2/3 pyramidal neurons. Feedback inhibition from SOM INs is recruited via excitatory input coming from the horizontal axons of pyramidal neurons. In this way, inhibition from SOM INs scales with the spread of excitation in layer 2/3. Given what was known about SOM INs, researchers in Bernardo Rudy’s group at NYU were surprised to find that when they optogenetically silenced the activity of SOM INs in brain slices (using conditionally-expressed halorhodpsin in the SOM-Cre mouse line), layer 4 pyramidal neurons fired less. Meanwhile, layer 2/3 pyramidal neurons fired more, as one would expect upon removing a source of inhibition. The key to this result lies in the distinct pattern of connections that layer 4 SOM INs exhibit compared to their Martinotti cousins. Analysis of layer 4 SOM INs revealed that their axonal arbors are restricted to layer 4, the layer of the cortex that receives thalamic input. In addition, layer 4 SOM INs exhibit electrophysiological properties that are distinct from Martinotti cells: notably, they have a more hyperpolarized resting potential and can fire at much higher rates. What about their functional connectivity? 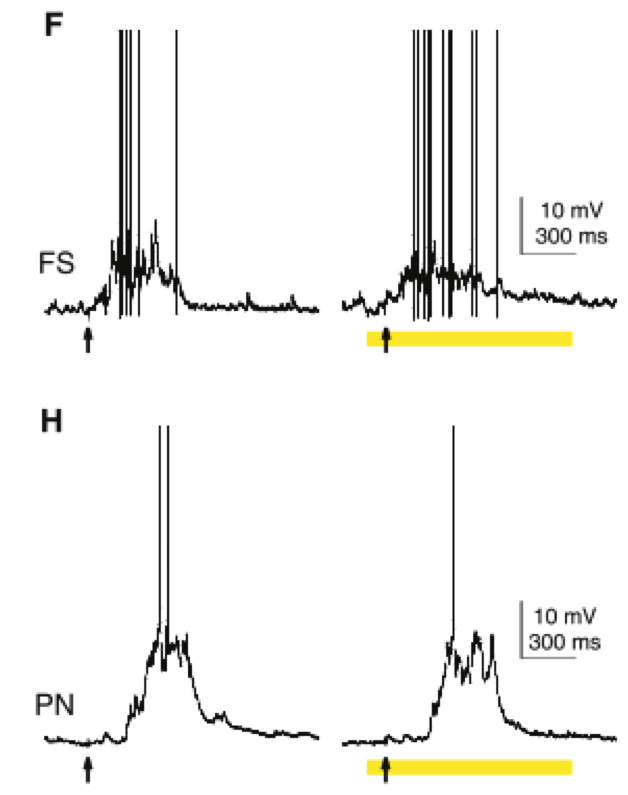 Dual recordings between SOM and either pyramidal neurons or fast-spiking (FS) GABAergic INs revealed that SOM INs were much more likely to be connected to FS INs than pyramidal neurons. The connection probability from SOM INs to FS INs in layer 4 was surprisingly high: 62%. Furthermore, measures of unitary IPSCs and IPSPs in response to SOM IN spiking revealed that response amplitude was consistently higher in FS INs compared to pyramidal neurons. This finding was also (rather heroically) confirmed by exciting a SOM IN and simultaneously recording responses in a FS IN and pyramidal neuron. Keep in mind that only SOM INs were fluorescently-tagged, so that FS INs had to be hunted for the old-fashioned way – by taking a guess, patching a selected neuron, and testing its spike properties. FS INs show larger inhibitory responses to SOM IN activation in layer 4, while pyramidal neurons show greater response in layer 2/3. Importantly, short term dynamics were similar across the two types of synapses. Unitary IPSCs evoked by SOM INs were moderately depressing in both FS INs and pyramidal neuron synapses confirming that FS INs really do “see” more inhibition than pyramidal neurons, whether SOM INs fire sparsely or repetitively. When the same experiments were performed in layer 2/3 the results were flipped: SOM INs were more likely to contact pyramidal neurons, and they inhibited them more strongly than FS INs. This set of experiments was repeated using a sexier approach (*cough* optogenetics) that produced the same results. Experimenters conditionally expressed ChR2 in SOM INs by injecting a virus encoding floxed ChR2 into the SOM Cre mouse line. They then recorded the light-evoked IPSCs in FS INs and pyramidal neurons. 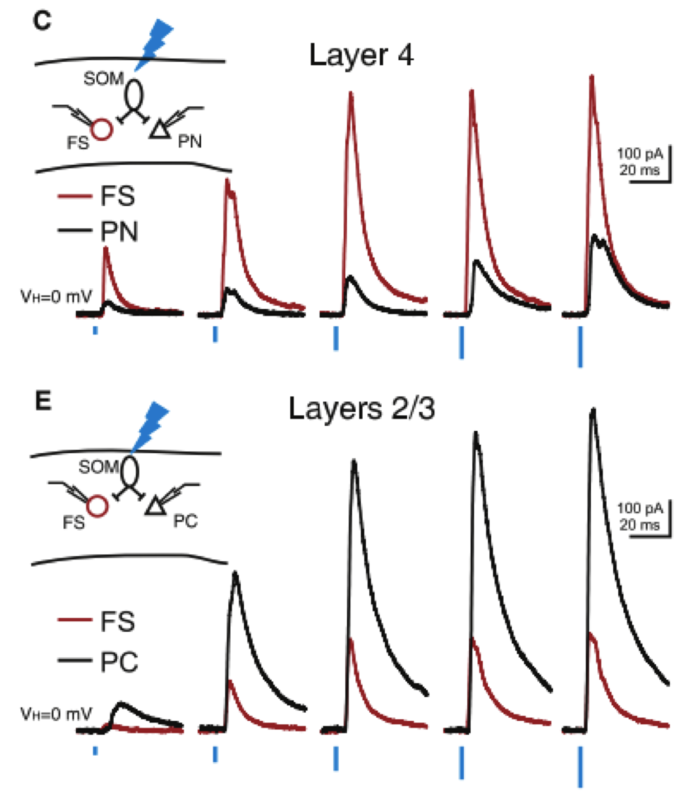 Given that the major role of layer 4 SOM INs, as defined by their functional connectivity, is to inhibit FS INs, it makes sense that silencing SOM INs reduces pyramidal neuron firing in layer 4. Based on connectivity, one would predict that silencing layer 4 SOM INs would remove inhibition placed on FS INs. Once disinhibited, FS INs would fire more and inhibit pyramidal neurons to a greater extent. Yellow bars indicate SOM IN inactivation. Arrows indicate thalamic stimulation. Layer 4 FS INs fire more when SOM INs are silenced while pyramidal neurons (PN) fire less. Indeed, researchers showed that optogenetically silencing SOM INs increased the number of spikes that layer 4 FS IN s fired during UP-states. Finally, to demonstrate that FS INs are the potent inhibitors of layer 4 pyramidal neurons scientists silenced FS INs using halorhodopsin expressed conditionally in the PV-Cre mouse line. Inhibiting PV INs significantly increased pyramidal neuron firing, supporting the notion that layer 4 SOM INs could indirectly excite pyramidal neurons by inhibiting PV fast-spiking interneurons. Most studies on inhibitory neuronal circuits have focused on the control that GABAergic interneurons can exert over excitatory neuronal activity, but we are beginning to uncover the interactions among GABAergic interneurons. These interactions may potentially form disinhibitory circuits that could serve to gate the transmission of information to excitatory pyramidal neurons. Andres Luthi’s lab reported the existence of a disinhibitory microcircuit that facilitates learning of an associative fear memory. Foot shock excites layer 1 INs in auditory cortex that in turn inhibit FS INs in layer 2/3. This results in disinhibition of pyramidal neurons that was necessary for acquisition of the auditory fear memory. Because all of the experiments regarding layer 4 SOM INs were performed in brain slices, we don’t know when this disinhibitory circuit could be activated in the intact brain. Previous studies suggest that layer 4 SOM INs only receive weak thalamocortical input, so it is unlikely that this disinhibitory circuit is recruited directly by thalamic activity. However, layer 4 SOM INs are potently activated by cholinergic inputs. An appealing possibility is that during heightened states of arousal cholinergic inputs excite layer 4 SOM INs. In turn, layer 4 SOM INs inhibit FS INs, thereby facilitating transmission of sensory information from the thalamus to the cortex. This study raises interesting questions to be addressed in vivo. *EDIT* thanks to Nick Olivas who reminded me of this 2012 paper studying the function of SOM INs in vivo during active whisking. It’s interesting to note that researchers found that layer 2/3 SOM INs become hyperpolarized during active whisking, increasing the excitability of pyramidal neuron dendrites. If at the same time layer 4 SOM INs are excited, layer 2/3 pyramidal firing could be driven further by increasing the excitatory relay from layer 4 pyramidal neurons onto readily-excitable layer 2/3 neurons. Neuroscientists at Stanford have discovered a brain pathway that controls a rat’s will to fight in a challenging situation. You’ve probably seen the “Hang in there!” motivational poster – the rat version would feature a tank of water with the caption,”Just keep swimming!” For decades, scientists have used the forced swim test (FST) as a means to model depressive behavior in rodents. This simple test measures what a rat does when it’s placed in a tank of water that it can’t escape – does it keep still and float or does it fight like hell to get out? Just as people handle stress differently, rats display a range of responses in the FST. Researchers quantify the time spent actively trying to escape (i.e. kicking and climbing) versus time spent passively floating, with the idea that rats that are behaviorally depressed give up more easily whereas resilient rats keep kicking. Immobility during the FST is interpreted as behavioral despair or “checking out” as a means of coping with stress. The switch from fighting to floating may reflect a rat’s assessment that kicking is probably useless. Similarly in depression, pessimism regarding one’s control over a situation can lead to feelings of hopelessness and a loss of motivation. Further evidence that the FST relates to human depression is the ability of factors like antidepressants and stress to alter the amount of time rodents spend immobile. In fact, FST is the most widely used behavior to test efficacy of antidepressants in lab rodents, with reduced immobility indicating a positive drug effect. You can check out a video of the behavior here. Scientists in Karl Deisseroth‘s lab wanted to identify a brain circuit that determines whether a rat selects an effortful or inactive behavior when challenged. In theory, FST was an ideal behavior because the transitions from active escape behavior to passive floating are clearly demarcated. Typically, FST activity is measured from video footage by motion detection software and human raters. However, this level of detail wouldn’t cut it for Dr. Melissa Warden and colleagues, who wanted to link real-time changes in brain activity to behavior. They came up with a simple yet ingenious hack to generate precise, time-stamped activity data: by placing an induction coil around the tank and attaching a small magnet the rat’s hind paw, a small current was generated each time the rat kicked. In search of an action selection circuit, Warden and colleagues recorded neuronal activity in the prefrontal cortex (PFC), a region that’s important for coordinating thoughts and behavior. The PFC’s ability to select appropriate actions to match internal goals is no simple task: an animal has to maintain a goal in mind (say, “mate”), plan actions (approach the female), and update its strategy based on feedback (she is not into it). Several notable human cases illustrate the PFC’s complicated role in action selection. Take Phineas Gage, whose personality was dramatically altered after he took an iron tamping rod through the PFC. It seemed that the once polite man lost his “filter” and was unable to resist the urge to make inappropriate remarks and curse like a sailor. On the flip side, some recipients of the infamous prefrontal lobotomy – a procedure that intentionally damaged the PFC – experienced a severe loss of will and motivation. The fact that PFC damage can affect motivational state in opposite directions suggested to researchers that they’d find a mix of neuronal responses in the PFC during the FST, with no simple “on means kick” type of phenomenon. 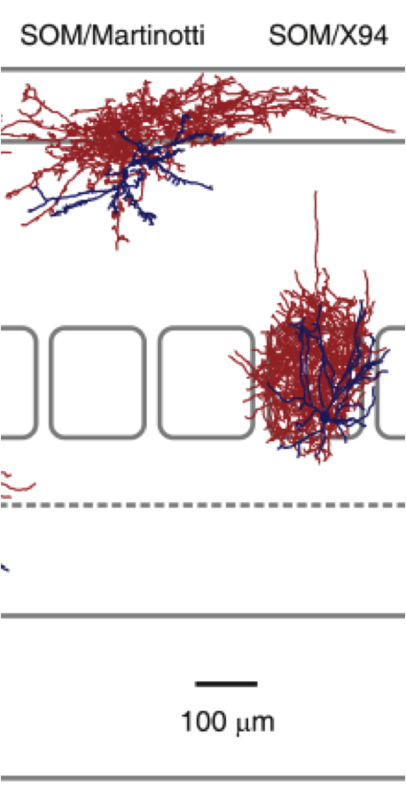 Arrays of individual PFC neurons were recorded before, during, and after the FST. Researchers predicted that activity of action selection neurons would be modulated by behavioral state within the context of the FST. Many neurons showed a straight-forward correspondence between firing rate and motion, most-likely reflecting motor activity and not behavioral control. However, a subset of neurons showed a surprising activity profile: they were highly active during the largely immobile pre- and post- FST periods, but during the FST they were active during kicking and silent during floating. Other neurons were more active during the mobile phase of the FST and appeared to turn on before kicks. Overall, the activity profiles were a mixed-bag, but researchers identified subsets of neurons that were shut-off during floating or that turned-on to “kick-start” escape behavior. Turning up the volume on an entire party would drown out the message of a small group. Despite mixed neuronal responses, researchers went ahead and tested if activating PFC neurons during the FST changed mobility. They injected a virus encoding instructions for making channel-rhodopsin (ChR2) into the PFC of rats. When ChR2 is expressed in neurons, blue light causes the channel to open, allowing positive ions to flow in and drive neuronal firing. When Warden and colleagues illuminated ChR2-expressing PFC neurons in the FST they saw no change in mobility. This is not so surprising, given how varied the neuronal activity profiles were: if only a small subset of neurons carried the signal for “SWIM!”, the signal would be lost in the noise when all PFC neurons were activated. 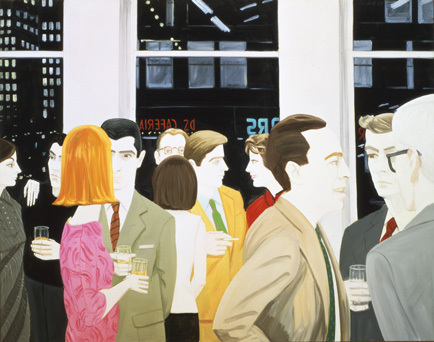 Imagine a small group of people scattered throughout a crowded cocktail party who are all saying the same thing. If the volume were turned up on the entire party, this message would be drowned out by chatter. The researchers now needed to narrow their manipulation to a select group of neurons that could influence behavior in the FST. Warden and colleagues illuminated ChR2 positive terminals in the DRN to selectively activate input from PFC. Warden and colleagues turned their attention to the dorsal raphe nucleus (DRN), a region that the PFC projects to that has also been implicated in motivated behavior and depression. Selectively activating the PFC–>DRN projection was a simple matter of aiming the light. ChR2 is not only expressed on cell bodies but can also be found at the axon terminal, the site of neuron-to-neuron communication. ChR2 virus was injected into the PFC, and the DRN was illuminated, activating input from the PFC. This time, the results were dramatic. When the light was switched on-and-off for 2 minute periods, kick frequency rose and fell with the “flip” of the light switch. Importantly, activating the PFC input didn’t increase locomotion outside of the FST, suggesting PFC–>DRN pathway activation specifically drives effortful behavior when the animal is challenged. In addition, pharmacologically blocking excitatory transmission at the PFC–>DRN synapse eliminated the effect. Interestingly, when they injected ChR2 virus into DRN and directly activated it, they found mobility was increased both in and out of the context of the FST. These differences in behavior suggest that PFC targets a specific subset of DRN neurons. Finally, when they performed the same experiment in the lateral habenula (yep, another brain area implicated in depression) they observed the opposite effect, with activation leading to a rapid reduction in mobility. Kick on, kick off. Light activation of the PFC to DRN projection increases kick frequency during the FST. Turn off the light and frequency drops. This study sends the message that in the brain, it’s not just about “who’s talking” but “who’s talking to whom”. This is clearly demonstrated by the observation that activating a mixed population of neurons in the PFC has no effect on behavior, while activating PFC axons at their target sites has profound and diverse effects. This study also highlights how the field of neuroscience has moved beyond the idea that “brain area x does y” and recognizes that it takes distributed circuits of neurons to carry out complex behaviors. With the wide variety of optogenetic tools available, we’re in a heyday of this type of circuits-to-behavior study. This paper is noteworthy for its creative solutions to studying the neural mechanisms underlying the widely-used FST and for the identification of divergent PFC pathways that alter the rat’s will to fight under challenging conditions. Finally, the ability of PFC projections to DRN and LHb to alter motivational state makes predictions for how these pathways may be dysregulated in human depression. Did this paper accomplish what it set out to do, to find the PFC circuitry that determines whether effortful or inactive behavior is selected in challenging situations? The ability of the PFC–>DRN pathway to initiate escape related behaviors and PFC–>LHb to switch kicking to floating was quite dramatic. However, there is a question of how artificial activation of this pathway relates to the normal FST behavior. Initial recordings in PFC identified a subset of neurons that were modulated by FST in a way that could reflect action selection. However, the authors skipped ahead to (somewhat arbitrarily) activate the PFC–>DRN pathway. It’s implied, but never demonstrated, that the neurons that are selectively silenced during the immobile phase of the FST are the DRN-projecting neurons. This experiment could be done by using a 2 virus system that requires retrograde infection of PFC neurons from DRN plus local viral injection in PFC in order to express ChR2. PFC neurons could be chronically recorded across pre-FST, FST, and post-FST and the DRN-projecting neurons identified via the PINP method. Warden M, Selimbeyoglu A, Mirzabekov J, Lo M, Thompson K, Kim S, Adhikari A, Tye K, Frank L, and Deisseroth K. A prefrontal cortex–brainstem neuronal projection that controls response to behavioural challenge. Nature. 18 Nov. 2012. Slattery D and Cryan J. Using the rat forced swim test to assess antidepressant-like activity in rodents. Nature protocols. 3 May 2012.